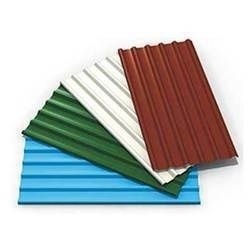 Our company has gained name and fame in offering Insulated Roofing Panels to the clients. 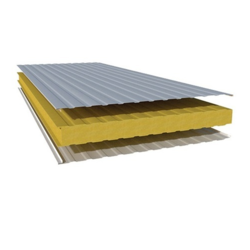 Insulated Roofing Panels are made using premium grade raw material and sophisticated technology and machine at unit under the professional leadership and supervision. Offered range can be used in various industries to meet the demands of variegated clients. These products are packed in special packaging material in order to ensure safe delivery at the clients' premises. Offered range is widely appreciated by clients for owning superb attributes. These products are available in different specification as per need of clients. Our company has been acknowledged in offering Polyurethane Foam PUF Panels to the clients. Polyurethane Foam PUF Panels are strictly manufactured by meticulous professionals keeping in mind the set quality standards utilizing supreme quality material and progressive technology. Offered range can be avail in various designs and sizes to cater to different sorts of hassle of valuable customers. This product is generally demanded in the market for high strength and accurate dimensions. Offered range is tested on several standards by quality controllers to make sure excellence. We are a prestigious company engaged in offering a superior quality of Profile Sheets. The offered profile sheet is designed by using modular components & leading techniques in accordance with the set norms of industry. As well, our offered profile sheet can be customized as per the customer’s specifications. Our customer’s can avail this profile sheet from us within a given time frame at nominal rates. 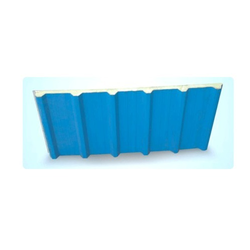 We are most eminent manufacturer and supplier of a comprehensive range of Eps Insulation Sandwich Panel. Our sandwich panel is ergonomically manufactured with quality proven material and modish technology under the direction of our professionals. We offer this sandwich panel on numerous customized options so as to meet the requirements of customers. 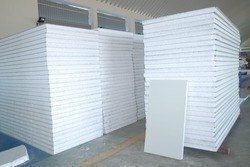 Our patrons can avail this sandwich panel from us at reasonable price in a stipulated time frame. Looking for Roofings & Ceiling Panels ?